Racism is a hot topic in museums today, as well as an urgent social issue. Focused on the broad field of multicultural policy, Museums and Racism examines how the Immigration Museum in Melbourne, Australia, has responded to political culture and public debate around racism. Analysis focuses on the conceptualization of the Immigration Museum in the mid-1990s, and on the most recent permanent exhibition to be opened there, in 2011, which coincided with the publication of a new multicultural policy for Australia. The opening of the National Museum of Australia in Canberra in the intervening period is also examined in some detail, as a comparative case study to provide a sense of the broader national social and political context. Message argues that each of the three episodes demonstrates the close relationship between museum and exhibition development on the one hand, and policy, politics, and public opinion on the other hand. 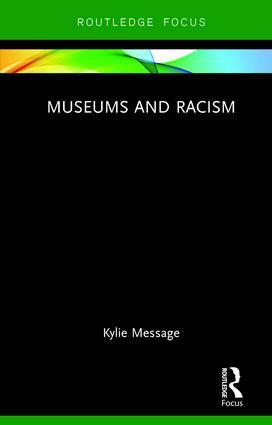 Including a discussion of examples from the United States and other relevant contexts, Museums and Racism is key reading for students and scholars of museum studies and cultural studies around the world. The book should also be of great interest to museum practitioners and policymakers in the area of multiculturalism. Kylie Message is Associate Professor and Senior Fellow in the Humanities Research Centre at the Australian National University. She is the Series Editor of ‘Museums in Focus’. Committed to the articulation of big, even risky, ideas in small format publications, Museums In Focus challenges authors and readers to experiment with, innovate, and press museums and the intellectual frameworks through which we view these. It offers a platform for approaches that radically rethink the relationships between cultural and intellectual dissent and crisis and debates about museums, politics and the broader public sphere. Museums In Focus is motivated by the intellectual hypothesis that museums are not innately ‘useful’, safe’ or even ‘public’ places, and that recalibrating our thinking about them might benefit from adopting a more radical and oppositional form of logic and approach. Examining this problem requires a level of comfort with (or at least tolerance of) the idea of crisis, dissent, protest and radical thinking, and authors might benefit from considering how cultural and intellectual crisis, regeneration and anxiety have been dealt with in other disciplines and contexts. Books published in the series are between 30,000 and 50,000 words in length and fully refereed. If you would like to discuss submitting a proposal, please contact the series editor: Kylie.Message@anu.edu.au. Further information about Professor Message's work can be found here: https://www.routledge.com/authors/i14753-kylie-message.